Hi! I love jewelry and I have quite a lot of it, but that is something that I have always liked and collected. Of course from time to time I reorganize my jewelry, give away pieces that I don't wear anymore so I could prevent any clutter. And I love keeping my jewelry where I can always see it, I don't like to hide it in the boxes simply because I would forget it and wouldn't wear it! 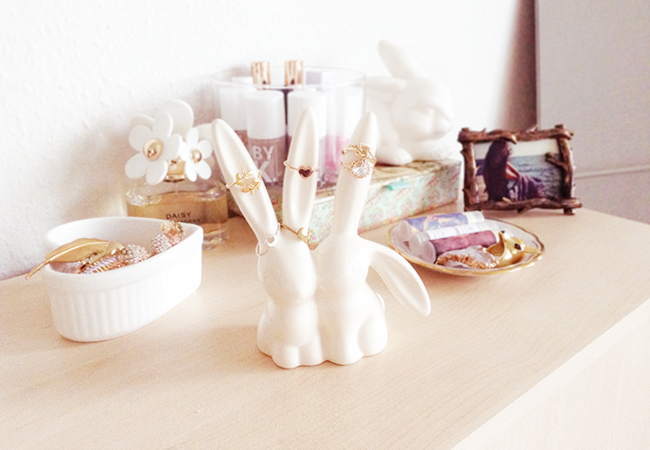 I store my jewels on various little plates, I keep some of my rings in the Marc Jacobs fragrances tin which I turned into a jewelry box, but my favorite ones are resting on these super cute bunnies ears that I recently received from Wonderelle! Isn't that the most adorable thing ever? As for my necklaces, I still keep them hanging on my DIY hanger which I have already showed you last year in this post. Just until I find a perfect hanger! Anyway, the most exciting part of this post is that Wonderelle is giving away a $75 gift card to one of you to spend on Wonderelle! They have the cutest decor stuff ever and this means you can't miss the chance! If you want to participate, you have to go to my facebook page >here< as the giveaway is held on facebook! The little bunnies are just so so cute ! Everything is so unique and definitely love the little bunnies! What a lovely post. I like every single piece of your jewelry! 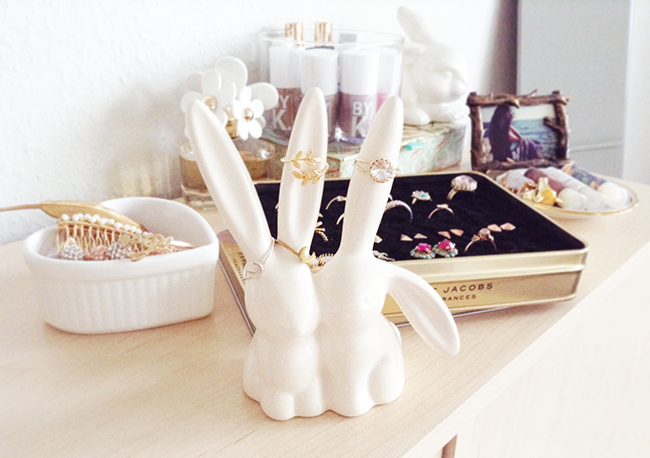 The Bunny ring holder is so adorable! 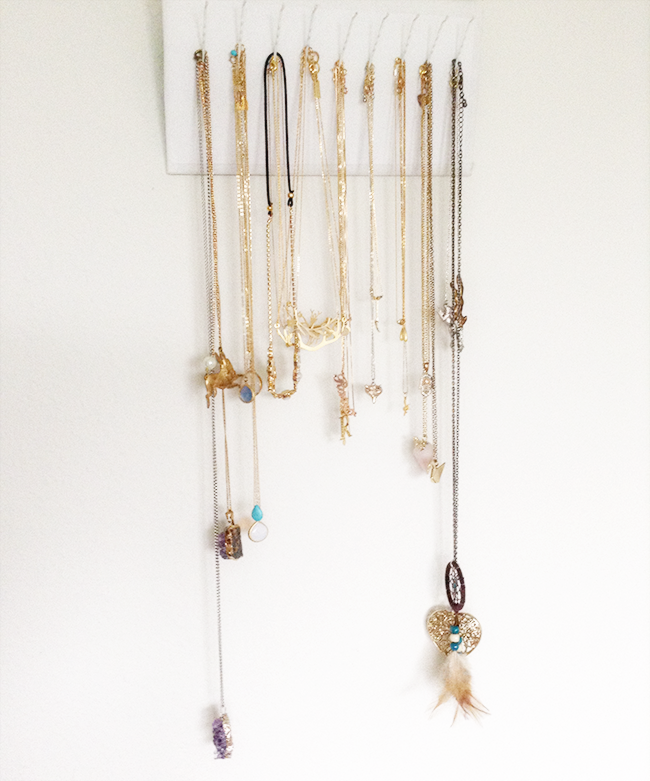 And I'm definitely going to go check out your necklace hanger post - I still haven't found a great way to store mine either, as most necklaces I own are those longer-length, pendant style ones. Hi dear! Thank you very much for checking out my blog, I follow you too!! Your blog and style are amazing!! Nice bunny. *__* I love it! I follow your blog. What a beautiful blog! And amazing photos in this post! I am hooked. Nice pieces!! thank you so much for your comment! I follow you with GFC and Bloglovin. I'm very happy if you do the same. omg! i just looove it ♥ so cute! I like to see everything too, because if not, I forget what I have!!! They really do have adorable things! I have a real jewelry mania and totally love these display ideas, love the bunny ears, fabulous job ! Thanks so much for your comment on my blog :) I'm now following you on GFC, Bloglovin, and Facebook. Very nice blog!! Would you like to follow each other on GFC, bloglovin and facebook? Please let us know. I follow you back via gfc/bloglovin. omygawd! such lovely decors! i love it! Great post! 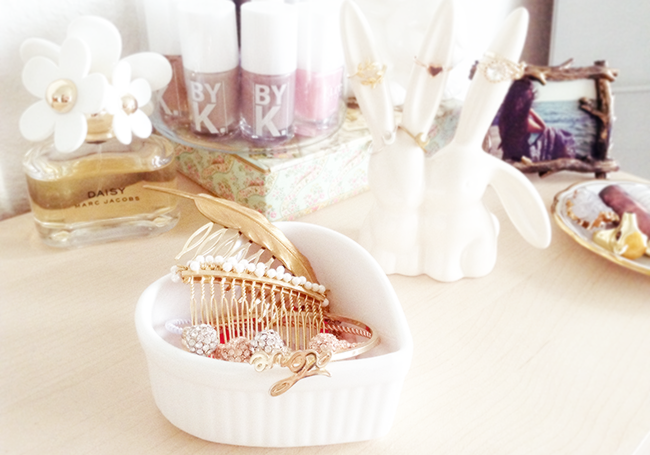 :) Love this jewelry storage! Anyways, thanks so much for visiting my blog and following me! I followed back instantly after seeing your amazing blog content and of course, how sweet you are! p.s. you blog is very very cute!!! followed you back via gfc, by the way! :) hoping to see more from you! Started following you via GFC and Bloglovin, would you like to follow me? you are so organized! so creative how you turned the marc jacobs box into a place to store your rings! love your blog, it's super cute. Love the jewelery stand!! So nice for the vanity space! Amazing give away! Your jewellery is so delicate and pretty, stunning stuff! oh wow i love that tin with all your rings in !! what an amazing idea ! I love the set up and your pieces. Wonderful! Many of your pieces would compliment those at www.rossanavanoni.com. Just my opinion of fine jewelry from both of you. Beautiful collection and I love the set up. Your pieces are so timeless. They compliment others I've seen at www.rossanavanoni.com. Just my humble opinion of fine jewelry from both of you. trash, cause its going to turn your skin green.